This HID conversion kit has an approximately 2900lm output, which is about 4 TIMES BRIGHTER than the halogen light and is much brighter than the original BMW and Mercedes HIDs. The good thing about HID is not only the fact that it is bright, it also saving 50% energy compare to the stock head lights. It only use 35V from your battery and provide a 2900LM output. All our HID system comes with instruction to install. This HID conversion kit comes with 2 mini ballast, 2 HID light bulbs, High Voltage (Bulb) Wires harness for plugging AND brackets for holding the ballasts. 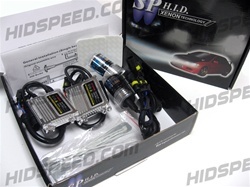 All our HID conversion kit is designed with plug and play. We are the direct importer and distributor for these HID conversion kit. Waterproof/Weatherproof slim ballast fits all vehicles which have projector or reflector headlights. This HID conversion kit has an approximately 2900lm output, which is about 4 TIMES BRIGHTER than the halogen light and is much brighter than the original BMW and Mercedes HIDs. The good thing about HID is not only the fact that it is bright, it also saving 50% energy compare to the stock head lights. It only use 35V from your battery and provide a 2900LM output. All our HID system comes with instruction to install. This HID conversion kit comes with 2 mini ballast, 2 HID light bulbs, High Voltage (Bulb) Wires harness for plugging AND brackets for holding the ballasts.